SQL Server Denali: CTP3 Insallation Error "The Data is invalid"
For x64 name of files is same, just replace x86 with x64. 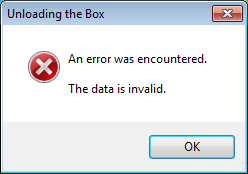 I found that “Data is invalid” error occurs when you have not downloaded “SQLFULL_x86_ENU_Core.box” properly. So I you are also facing same error, repeat your download process for only “SQLFULL_x86_ENU_Core.box” and re-execute SQLFULL_x86_ENU_Install.exe. Would you like to share, error you are facing.